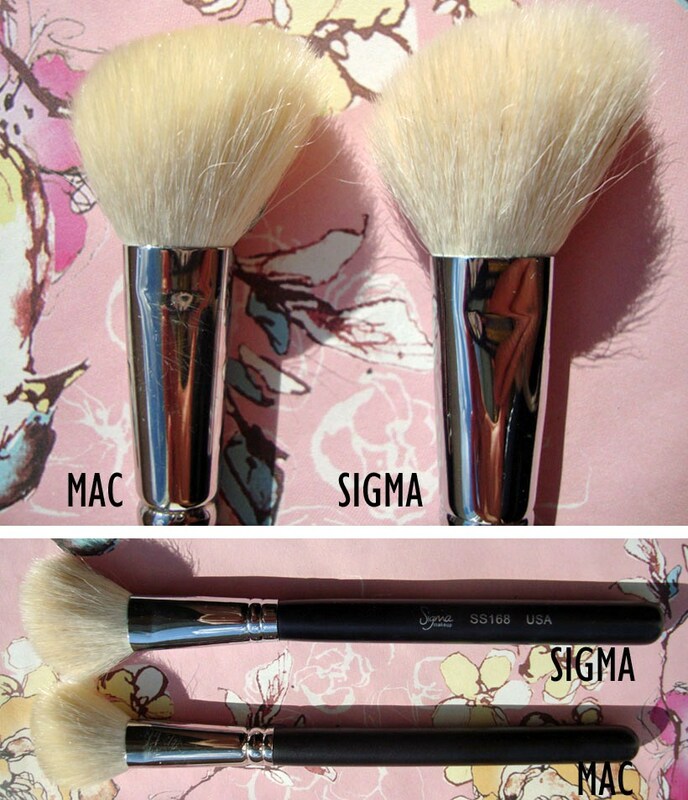 B U B B L E G A R M: Spotlight on Sigma brushes! 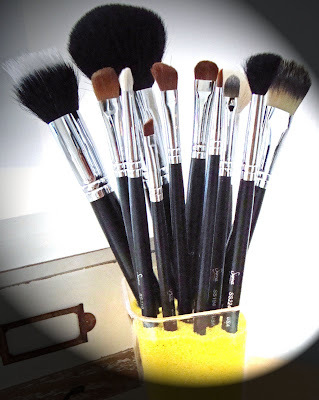 I was sent the Sigma essential brush kit for face and eyes to try a few months ago, I waited a while before I reviewed them to see how they behaved after I used and washed them several times. 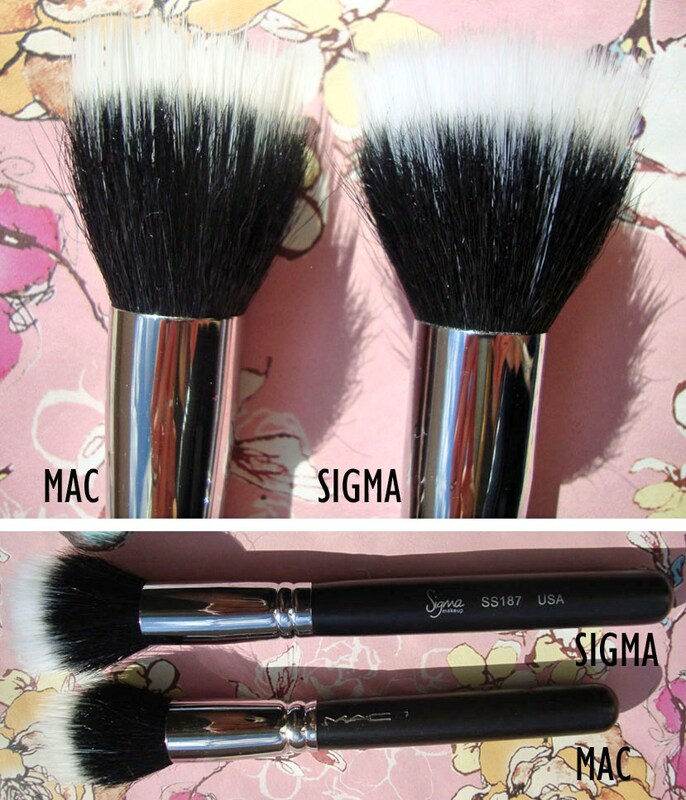 Sigma is a brand that has quickly become popular for replicating Mac's brushes. 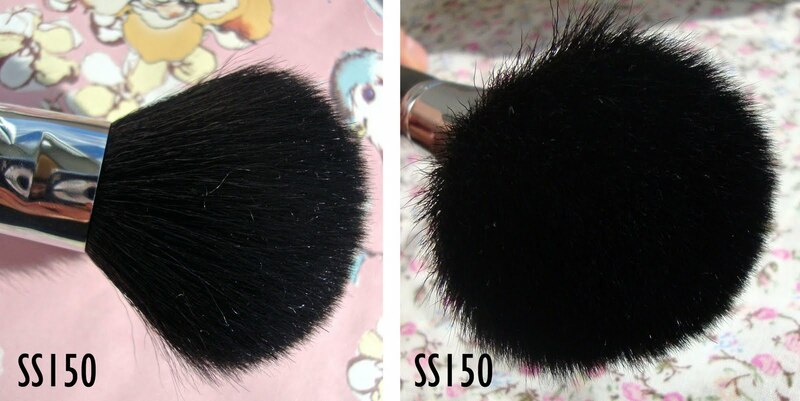 A Mac 187 brush is known as a SS187. Their prices are much more affordable making it more appealing to those trying to save money. But, the big question is, how good is their quality when priced so low? There are 12 brushes in the kit priced at $69 which works out at roughly £45. A bargain when you know that a face brush from Mac is approx £30. How do they compare to Mac? Take a look, almost identical. My Mac 168 states it was made in Japan, and the Sigma was made in the US. The Mac is slightly lighter in weight which could be due to the fact that Sigma handles are much longer. 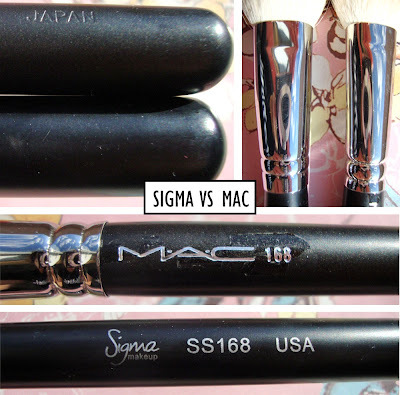 Also, I have noticed that the Sigma black handles are slightly glossier than Mac. The Sigma 168 brush circumference was much smaller than the Mac 168 initially but after washing it expanded in size. With the Sigma 168 I haven't detected a difference in application from the Mac. The hairs are as soft as Mac and overall a great dupe. The Sigma 187 is a different story, almost every time I wash it blue dye leaks into my sink. The hairs shed even more than the Mac 187 which is very disappointing. The Sigma 209 is a perfect eyeliner brush, you can see in the picture below how tapered the end is, I love this brush so much that I actually got rid of my Mac one. 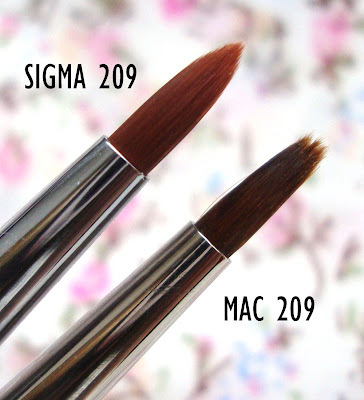 One of my favourite Sigma brushes is definitely the SS224, perfect eyeblening brush. I also like the SS150, it's soft and I can use it for multiple things. I use it mainly to apply powder and squeeze the bristles for angular application of blush, bronzer and highlight. However, this brush does shed, which is SO annoying but this happens with even my Mac brushes so I can't complain too much. I have also noticed some blue dye leaking from this one when I wash it too. I was also sent an eyeshadow in "Indian Girl" which I hated as it's so chalky and powdery and very difficult to blend. I also dislike the patterened hetchmarks, I would not recommend the eyeshadows at all! Overall, the Sigma brushes are fantastic value for money, I wouldn't say that they are better quality than Mac but they are as good as. I would recommend them to anybody who is looking to build up a brush collection. I found all of the eyeshadow brushes to be brilliant, I don't have one complaint. The face brushes are good too but, would be much better if there was no shedding and leakage of blue dye with the darker haired brushes when washing. What is your opinion of Sigma brushes? Click HERE to shop and find out more about Sigma. Disclaimer: I was sent the brushes for review purposes, I did not get paid to blog about them and I am not affiliated with the brand in any way. This is my honest opinion as always. I don't think they are perfect. My SS 150 is even a bit scratchy and my duo fibre brush bleeds like no tomorrow with every wash. However, I have to say that they are the best you can get for the price and they imitate well designed brushes. I love my SS 217 and 224 and 197...I use them every single day! But boy, they stink! They smell like animal farm or something like it, even after having washed them several times (I have mine for around 8 months now). @Bia I haven't noticed a smell with mine, but I've only had them for a few months - Eeek! Yes, the 150 sheds and leaks blue dye with washing - so annoying! I haven't tried their 217, the 224 is amazing! Great post hun, I've been thinking of buying this set as I find that the MAC brushes are just so overpriced! Lovely review, seems to be mixed reviews on these. I quite fancy trying the flat top bronzer one they have just launched that looks good. I want to try them as well. Apparently from what I know is that the lady who set up Sigma didn't try to copy the MAC brushes completely but to create very similar ones with minor changes trying to make them better according to her taste and opinion. Regarding the names/numbers...I don't mind...MAC obviously didn't patent that system so anyone can use it really. fab review, I really want to get some Sigma brushes! Isn't the way they've named them a bit cheeky.... i.e just like MAC? I do not own any of the MAC brushes because I can't afford them, besides even if I could there are tons of better stuff to buy instead then spend huge amount on brushes. However, I bought the travel kit of Sigma brushes, because I think that it contains all the brushes I actually need minus eyeliner brush but it doesn't bother me because I use pencil eyeliner :) Overall I am very pleased with them and won't replace them any time soon. Great review btw :) Have a nice day ! I haven't really looked into Sigma brushes, but if you 're looking for specific ones, I 'm sure it's a good alternative..! Nice review! However, Sigma brushes aren't made in the U.S.- they're made in China (I wrote to the company to verify this when I wrote a really long post about the premium brush kit). Love your blog! Do they have a 217 dupe? Ive always wanted to try sigma brushes, where can you get them in the UK?? that liner brush does look pretty great--i've had friends ask about the line and although I haven't tried them for myself, I've yet to see a terrible review. Thanks for the comparison!